32.7 mm stainless steel and yellow gold case, domed scratch-resistant sapphire crystal with anti-reflective treatment inside, white mother-of-pearl dial with Roman numerals and index hour markers, self-winding chronometer Omega 2500 movement with Co-Axial Escapement, approximately 48 hours of power reserve, stainless steel and yellow gold bracelet. Water resistant to 100 m.
32.7 mm stainless steel and yellow gold case, domed scratch-resistant sapphire crystal with anti-reflective treatment inside, champagne dial with Roman numerals and index hour markers, self-winding chronometer Omega 2500 movement with Co-Axial Escapement, approximately 48 hours of power reserve, stainless steel and yellow gold bracelet. 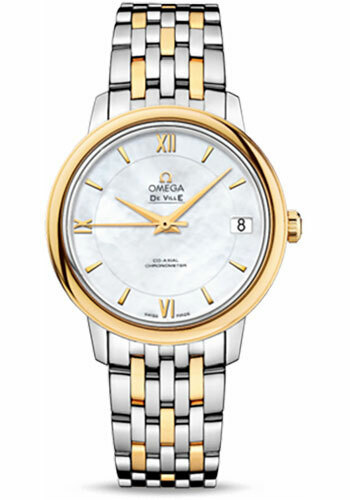 Water resistant to 100 m.
32.7 mm stainless steel and 18K yellow gold case, scratch-resistant sapphire crystal anti-reflective treatment inside, white silvery dial with a silk-like pattern and an opaline finish, Caliber Omega 2500 self winding movement with rhodium-plated finish, chronometer, date, approximately 48 hours of power reserve, stainless steel and yellow gold bracelet. Water resistant to 3 bar (30 metres / 100 feet). 32.7 mm stainless steel case, sapphire back, 18k yellow gold bezel, domed scratch-resistant sapphire crystal with anti-reflective treatment inside, blue dial with diamonds, caliber 2500 self-winding movement with its date window at 3 o’clock, approximately 48 months of power reserve, yellow gold-steel bracelet. Water resistant to 3 bar. 32.7 mm stainless steel case, sapphire back, 18K yellow gold bezel, domed scratch-resistant sapphire crystal with anti-reflective treatment inside, white mother-of-pearl dial with a unique polished butterfly pattern enhanced by a transferred outline against a matt background, caliber 2500 self-winding movement with chronometer and a date window at 6 o'clock, approximately 48 hours of power reserve, yellow gold-steel bracelet with two tone. Water resistant to 3 bar. 32.7 mm stainless steel and yellow gold case, domed scratch-resistant sapphire crystal with anti-reflective treatment inside, champagne dial with Roman numerals and 8 diamond hour markers, self-winding chronometer Omega 2500 movement with Co-Axial Escapement, approximately 48 hours of power reserve, stainless steel and yellow gold bracelet. Water resistant to 100 m.
32.7 mm stainless steel and 18K yellow gold case, scratch-resistant sapphire crystal anti-reflective treatment inside, champagne dial with a silk-like pattern and an opaline finish, Caliber Omega 2500 self winding movement with rhodium-plated finish, chronometer, date, approximately 48 hours of power reserve, stainless steel and yellow gold bracelet. Water resistant to 3 bar (30 metres / 100 feet). 32.7 mm stainless steel case, sapphire back, 18K yellow gold bezel, scratch-resistant sapphire crystal with anti-reflective treatment inside, white mother-of-pearl dial with diamonds and a unique polished butterfly pattern enhanced by a transferred outline against a matt background, caliber 2500 self-winding movement with chronometer and a date window at 6 o'clock, approximately 48 hours of power reserve, white satin-brushed leather strap. Water resistant to 3 bar. 32.7 mm stainless steel and 18K yellow gold case, scratch-resistant sapphire crystal anti-reflective treatment inside, white silvery dial with a silk-like pattern and an opaline finish, Caliber Omega 2500 self winding movement with rhodium-plated finish, chronometer, date, approximately 48 hours of power reserve, light brown leather strap. Water resistant to 3 bar (30 metres / 100 feet). 32.7 mm stainless steel and 18K yellow gold case, scratch-resistant sapphire crystal anti-reflective treatment inside, champagne dial with a silk-like pattern and an opaline finish, Caliber Omega 2500 self winding movement with rhodium-plated finish, chronometer, date, approximately 48 hours of power reserve, brown leather strap. Water resistant to 3 bar (30 metres / 100 feet). 32.7 mm stainless steel and yellow gold case, diamond bezel, domed scratch-resistant sapphire crystal with anti-reflective treatment inside, white mother-of-pearl dial with Roman numerals and 8 diamond hour markers, self-winding chronometer Omega 2500 movement with Co-Axial Escapement, approximately 48 hours of power reserve, stainless steel and yellow gold bracelet. Water resistant to 100 m.
32.7 mm stainless steel case, sapphire back, diamond-set 18K yellow gold bezel, domed scratch-resistant sapphire crystal with anti-reflective treatment inside, white mother-of-pearl dial with diamonds and a unique polished butterfly pattern enhanced by a transferred outline against a matt background, caliber 2500 self-winding movement with chronometer and a date window at 6 o'clock, approximately 48 hours of power reserve, yellow gold-steel bracelet with two tone. Water resistant to 3 bar. 32.7 mm stainless steel and yellow gold case, diamond bezel, domed scratch-resistant sapphire crystal with anti-reflective treatment inside, champagne dial with Roman numerals and 8 diamond hour markers, self-winding chronometer Omega 2500 movement with Co-Axial Escapement, approximately 48 hours of power reserve, stainless steel and yellow gold bracelet. Water resistant to 100 m.
32.7 mm stainless steel case, sapphire back, diamond-set 18K yellow gold bezel, domed scratch-resistant sapphire crystal with anti-reflective treatment inside, white mother-of-pearl dial with diamonds and a unique polished butterfly pattern enhanced by a transferred outline against a matt background, caliber 2500 self-winding movement with chronometer and a date window at 6 o'clock, approximately 48 hours of power reserve, white satin-brushed leather strap. Water resistant to 3 bar.